Boatman Marking carries a large variety of foil gusseted bags that come in various sizes and colors to fit your packaging needs. Due to the high barrier qualities of foil, it is being used in countless packaging applications including our gusseted foil coffee bags. 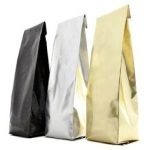 The sizes for our foil gusseted bags range from 2oz. to 5lb. There are three different types of seals for gusseted bags which are side-seal, center-seal, and concealed-seal. The side-seal style allows labels to be applied smoothly since the label does not have to cover the seal and comes in 4oz., 8oz., and 16oz. The concealed seal on the 5lb. bags creates extra durability to prevent the bag from bursting. The center-seal style is available in 2oz. and 2lb. These particular foil gusseted bag are 4oz. in size and have a center-seal style. Their dimensions are 2.75" (W) x 1.5" (G) x 8.25" (H). Get your foil gusseted bags and other packaging needs at Boatman Marking.